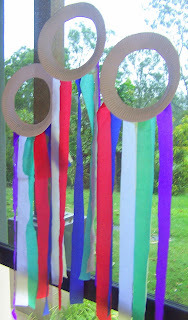 These Rainbow Streamers are so easy to make (you probably already have everything you need at home) and so much fun to play with. Cut a hole from the inside of a paper plate. Small ones would work well for little hands. Cut a few strips of various coloured streamers and adhere to the back of the plate, leaving room at the top for a handle of sorts. These are great to wave in the breeze or dance around the room with. 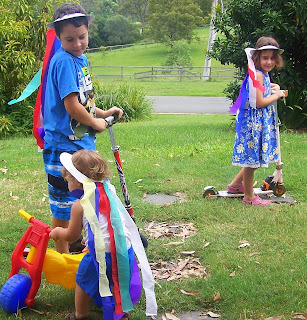 Although my kids thought they were fantastic hats and on a day with some breeze outside they decided it was the perfect opportunity to go grab their scooters and have their Rainbow Streamers trail off into the breeze. They also look great as a window decoration, when they aren't being played with. Kylie, the streamer hats look like so much fun. I can imagine my children having a ball running around outside with them on their heads. I can not get over all of the St Patrick's Day activities and resources you have created. Looks like you have been super, super busy. They are wonderful. I am going to be printing some off these to do next week (and of course linking back to you when I publish a blog post about our week). Thank you so much for sharing all of your hard work. These are so cute! We are going to have to make some this weekend :-). Thanks for sharing your wonderful ideas!! Love the rainbow streamers! So cute. I will defintely have to try this with my little one! 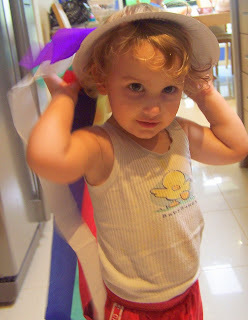 The streamer hats are wonderful - I am thinking of doing two things for St Patrick's - those hats and a sun catcher. Thanks for those beautiful ideas and printables. Cute pictures too - it looks like kids had a lot of fun!